But I do like some of her psychological insights in her latest book, Women and Money. Recounting some of her own misadventures with money, she talks about how woman often devalue themselves and treat themselves as a commodity to be priced by others. On her show, she constantly tells women they’re putting themselves “on sale,” meaning discounting their true talents and worth. She’s getting at an important truth when it comes to money management: You can’t save it if you don’t earn it. You have to believe in yourself and boost your value in the marketplace, be it the labour market or the marriage market. It’s no coincidence that women who don’t value themselves end up with men who don’t value them either. 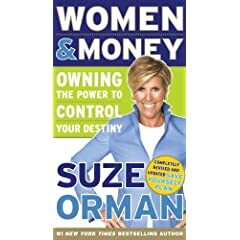 Suze pushes women into taking care of their finances following a five-month plan she lays out. Unfortunately, much of her information is relevant only to US readers. And she keeps sending readers to her website, where information is for sale and not freely offered. Even the book’s back cover is controversial, since she’s made a deal with a stockbroker for readers who open accounts. She sells more books by offering this $100 discount coupon with TD Ameritrade, which makes some people suspicious. Her advice is basic, almost too simple, in some readers’ opinion, but it’s meant for absolute beginners. And most people seem to like it, judging the comments at Amazon.com. Youâ€™re choosing between two products at a consumer electronics store. One has a mail-in rebate that reduces the price by $50. The other has no mail-in rebate. What do you buy? Most shoppers pick the lower-priced product. In fact, stores like to advertise the price after deducting the $50 discount. But thereâ€™s a problem with mail-in rebates: They often go astray. Thatâ€™s why Canadaâ€™s largest electronics retailer says itâ€™s eliminating mail-in rebates. Instead, consumers will get rebates instantly at the cash register at the time of sale, much like any other price discount. The move is to be announced next week by Best Buy Canada Inc., which operates the Best Buy chain as well as Future Shop stores. Two years ago, Best Buy promised to work with suppliers to phase out mail-in rebates because of consumer complaints. Hereâ€™s why mail-in rebates can be frustrating. You spend time gathering the paperwork and sending in your application, only to find the cheque is not in the mail. You spend more time tracking down the rebate, only to find you forgot to include something or the deadline for redemption has passed. Many customers donâ€™t even bother to send in their rebate applications. Half of all rebates are never claimed, retailers say. The higher the discount relative to the product price, the more likely you are to spend time trying to get it. What if other stores follow Best Buy and adopt instant cash rebates? Manufacturers say there will be more people getting the discounts. This means the discounts will go down. Instead of a $50 mail-in rebate, they will offer a $25 instant cash rebate. However, Best Buy says consumers can expect to see prices remain low because the electronics industry is so competitive. Itâ€™s more likely that retailers and manufacturers will take a hit on their bottom line to get rid of this promotional tactic. I think mail-in rebates have got to go. I prefer price discounts that everyone can get at the time of sale. So does Wal-Mart, which is becoming a big force in consumer electronics and uses an everyday low prices approach. Say good-bye to pie in the sky and say hello to cash in the hand right away. Is Bell’s service worse than Rogers? Some readers think they’re the same: bureaucratic, prone to mistakes, inconsistent and quick to send accounts for collection. Both use voice recognition systems that people dislike. But there are a few differences. Bell outsources many calls to India, while Rogers uses Canadian call centres. Bell’s home phone business is regulated by the CRTC, while Rogers’ home phone business is not. So, there’s a mandatory $55 installation charges for Bell clients when they move, but not for Rogers clients. Rogers is distrusted because of the negative option plan for cable TV channels it tried to impose back in the mid-1990s. But Rogers learned from that experience and tried harder. Bell earned customers’ trust when it was a monopoly, but in the face of competition it’s aggressively cutting costs and lowering the quality of service. So people who still admire the company are shocked when they run into mediocre and insensitive treatment from employees. The Canadian Bankers Association defends high service charges. But many readers don’t. They loved my columns about bank fees and credit card fees, but some had strong feelings about customers who don’t pay attention to fees or don’t do their best to minimize them. What do you think? Are banks taking advantage of us? Or are we being complacent? I have enjoyed reading your columns in the Star for years. As an accountant I think of myself as fairly financially savvy but I often learn new things through it. In reading the Jan. 28 column, it strikes me that one situation that I have seen very little written about or discussed is the death of poor people. I guess this is particularly true because of my own involvement in such a situation. My father passed away in September of 2003. He was 78 and lived alone on CPP, OAS and GIS. When he died, he lived in a cramped one-room apartment with less than $1,000 in his bank account and no other assets and just a small amount of credit card debt. I am one of seven surviving sons or daughters (two from a previous marriage that I have never met), and my mother predeceased him, so that made the seven of us his “next of kin”. He died with no will. I found dealing with all the complications frustrating and complex. With no will, there is no executor, so it was hard to cancel things (phone, cable, credit cards, etc.). I did look into the Ontario Public Guardian’s office, but the paperwork and cost (more than his estate!) were simply way too involved to contemplate. And the thought of the complications I would have to go through in terms of searching for survivors also put me off. Luckily, my brother knew the bank manager at our Dad’s bank so we were able to close the account. Up to a year later I was still getting mail from places like Rogers about his account. I got tired of telling them he was dead, so I simply threw away the mail.